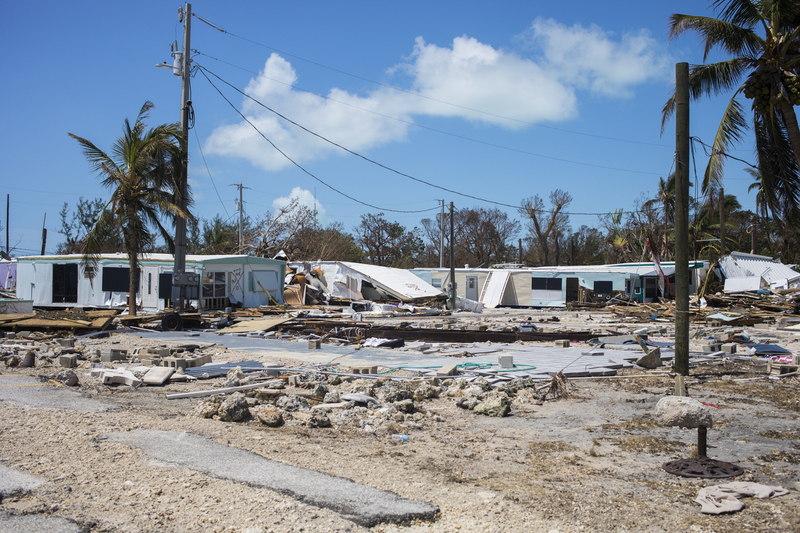 Returning Home To The Florida Keys After Hurricane Irma About half of the 106 trailers at the Sea Breeze Mobile Home Community are destroyed or moved off their foundations. 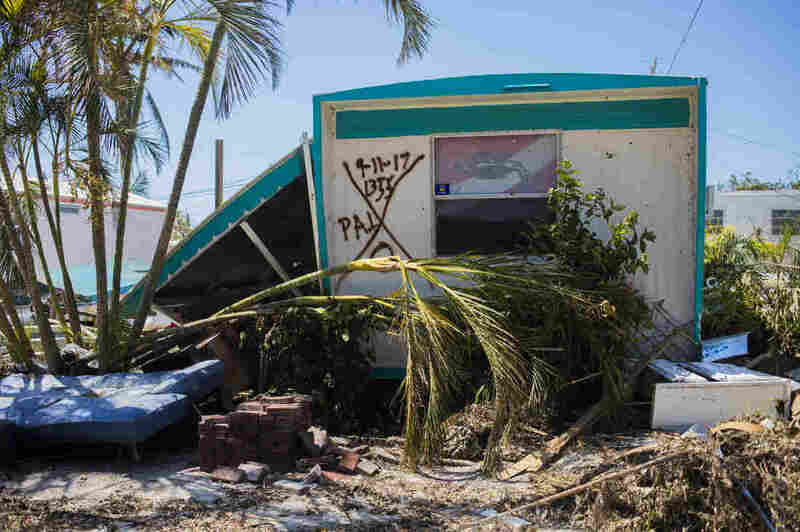 Hurricane Irma nearly demolished the Sea Breeze Mobile Home Community in Islamorada, Fla., making the area unlivable. 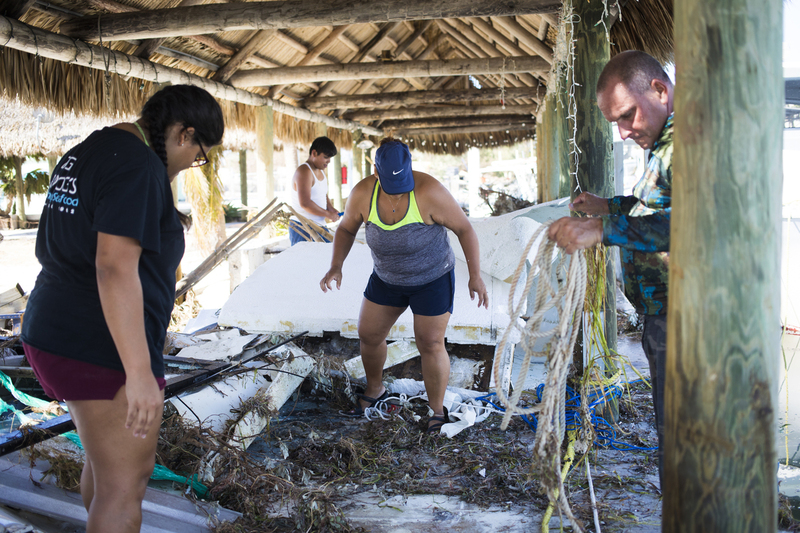 At the Sea Breeze Mobile Home Park in Islamorada, residents came back Tuesday to a scene of devastation. Bill Quinn described the spot where his family's trailer once stood as "just a concrete slab." Quinn's grandfather bought the trailer 56 years ago. Bill Quinn stands where his home once sat in Sea Breeze Mobile Home Community on Tuesday. The home was passed down three generations and had an ocean view. "There's not even a stick hanging up on the frame itself," he said. "There's not even a screw in it. There's nothing." It was just 25 feet from the water. Irma's high winds and storm surge blew apart his home and at least a dozen others. Residents say the Sea Breeze is a close-knit community, a place waitresses and others who work in the Keys' tourist economy can live and enjoy its laid-back island life. Another homeowner, Rick Peterson, says now the community is "trashed." He said that "it looks like a bomb went off on the ocean side." Looking at a large pile of lumber, siding and furniture, Peterson remembered, "There were four trailers between this one ... and the water. ... Leveled, pure devastation." Hopefully, they won't bulldoze it and put up condos. Many of the people who lived here own their trailers but rent the pad space from the park's owners — some on month-to-month leases. Patty Purdo says she loved the mobile home park so much that she sold her nearby condo to move in there. She was working with friends Tuesday to save whatever personal effects she could. Because her door was blocked by debris, they had to use a power saw to cut a hole in the opposite side of the home to get inside. Now, she wonders whether she'll ever be back. "We're doing our best. Everybody's coming together. We'll stick it out. Hopefully, they won't bulldoze it and put up condos." Quinn estimates that at least half of the 106 trailers at the park are destroyed or moved off their foundations — essentially totaling them. He is hoping FEMA will help the homeowners here rebuild and the park's owner allows them to return. "What's happening is that all the money is coming in down here in the Keys and its forcing the lower income people out," he said. "We're the people that are serving you your coffee in the restaurants. We're the ones building your sheds. And we're the ... people doing the work for the rich people you could say. There's no need to take it away. We just need to rebuild." We're the ... people doing the work for the rich people you could say. There's no need to take it away. We just need to rebuild. In the part of the island chain closest to the mainland, the road was open Tuesday and residents were allowed to return. Officials says damage from Irma is much worse in the islands closer to the place where the storm made landfall, Cudjoe Key, near Key West. 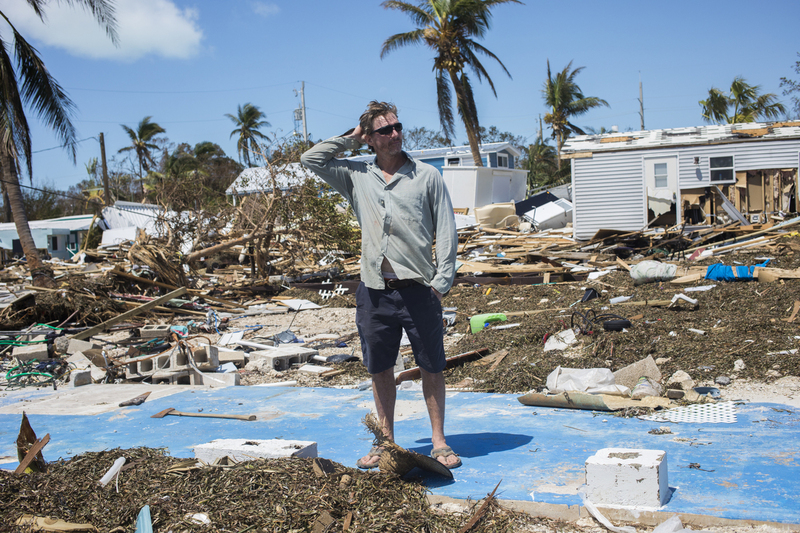 Throughout most of the Keys, there is no power, no phone service and no running water. On Tuesday, convoys of trucks carrying relief supplies streamed past checkpoints headed to the Upper Keys, where an estimated 10,000 remained despite evacuation orders. Mirna Narvaez (center) and her husband Miguel Lechuga (right) assess their family's commercial fishing boat after losing countless crab and lobster traps in Tavernier, Fla. Throughout the Lower Keys, the houses with concrete block construction, mostly survived largely intact. But nearly every home was damaged by Irma's 4- to 6-foot storm surge. The damage is worst for those homes and businesses right on the water. At Robbie's Marina, a popular spot elsewhere in Islamorada, the docks are now gone and there is extensive damage. At another marina used mostly by commercial fishermen, the scene was similar. Buildings are destroyed and wooden docks are gone. Miguel Leguna and his wife, Mirna Narvaez, were there checking their boat. They moored it in a protected spot in the marina before the storm and were relieved to find just minor damage. 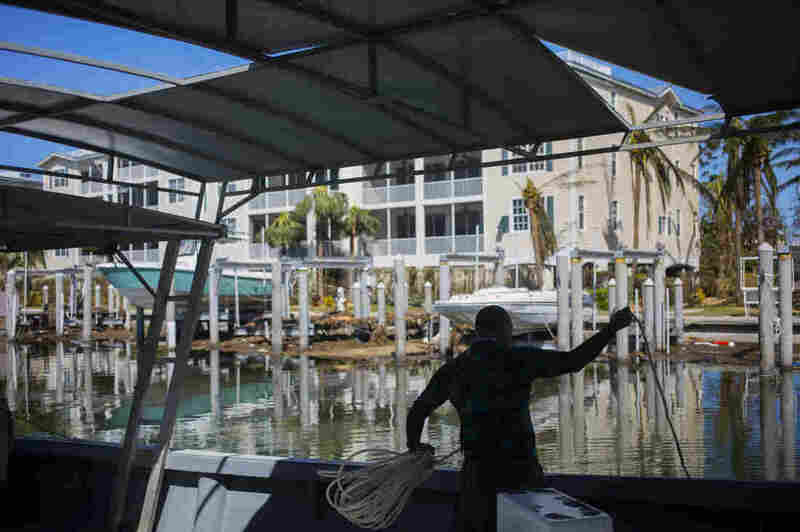 Narvaez is now worried most of all about her traps — used to catch spiny lobsters and stone crabs, two lucrative catches for which the Keys is famous. Before the storm, she had thousands of traps in the water marked with floats. Now, in Irma's aftermath, the floats are gone and she worries she'll end up losing many of her traps — worth some $500,000. Making matters worse, Irma came in the middle of lobster season and stone crab season is just a month away.